This rich panang curry is what we like to call a “weeknight curry”, packed with flavor with only a few ingredients. Kaffir lime leaves are used throughout Thailand– they bring a rounded citrus note and are an essential ingredient to this dish. If you’d like to release a bit more of their flavor, gently fold them in your hands before you add them to the simmering curry. The green beans will be crisp tender when ready, so watch them carefully. Rinse and dry the produce. Peel and mince the ginger. Place a small saucepan over medium-high heat with 1 tsp vegetable oil. Add 2 tsp minced ginger and cook until fragrant, about 1 minute. Add the jasmine rice,1 cup water, and a pinch of salt to the saucepan and bring to a boil. Reduce heat to low and cook, covered, until all water is absorbed and rice is tender, about 13 to 15 minutes. Peel and chop the onion. Leaving the peel on, dice the sweet potato. Trim and halve the green beans. Place a large pot over medium-high heat and add 1 tbsp vegetable oil. Add the onion and remaining ginger and cook until onion has softened slightly, about 2 to 3 minutes. Add the panang curry paste and cook, stirring constantly, for an additional 30 seconds. Add the diced sweet potato, coconut milk, kaffir lime leaves, and ¼ cup water to the pot. Reduce heat to low and simmer curry until the sweet potatoes are tender, about 12 to 15 minutes. Drain the garbanzo beans and add to the pot along with the green beans, stir, and simmer until green beans are just tender, 3 to 5 minutes more. Zest the lime. Finely chop the cashews. Add the lime zest and cashews to the cooked rice and season with salt. Halve the lime and squeeze half into the curry. Remove the kaffir lime leaves and discard. Stir, taste curry, and adjust seasoning with salt and pepper. 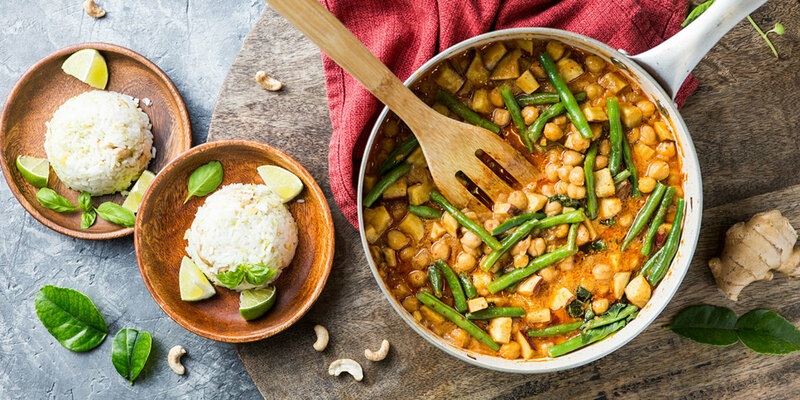 Divide the ginger cashew rice between large bowls and top with sweet potato panang curry. Tear the basil leaves with your hands over the bowls and serve with remaining lime.